If you live in Philly, you should be quite familiar with The Deli’s Philly Best Emerging Artists Poll Winners, Sun Airway. Well, this week the former A-siders will be descending down to SXSW to perform anywhere and everywhere as many up-and-coming indie acts tend to do, but we are certain that our champs will leave their mark on this year’s festival. We had a chance to catch up with Sun Airway’s Jon Barthmus before he started his journey down to Austin, and surprisingly there wasn’t much talk at all about this week’s chaotic schedule of events (you can find Sun Airway's SXSW schedule as well as other Philly acts here). But Jon was nice enough to share with us some of his personal favorite things and possible future plans on the horizon for Sun Airway. The Deli: What was the last thing that you’ve won non-music related? Jon Barthmus: I usually tend to not win things. It makes me bad at gambling. I went to a county fair last summer and won an inflatable rifle. TD: Any big tours or shows you are looking forward to in the future? JB: Looking forward to it all...think we’re doing a week of shows in the Midwest all in barns. Also really excited about playing the Pitchfork Festival in July. Hoping to get over to Europe this year as well. TD: What is the coolest thing that you’ve seen in the audience while performing on stage? JB: Well, not that this was particularly cool, but we played a show in Delaware to a major college party-type crowd, and these girls in the front row just started making out. TD: What do you find distracting while you're on stage? JB: I find people texting or doing whatever on their phones pretty distracting. There’s a new phenomenon with twitter et al where you’ll see people in the crowd taking a picture of you and posting it to twitter. Just crazy that all this can happen while you’re still playing. TD: What’s your favorite thing to do after a show on tour? JB: Drink some whiskey. Hang out. Hopefully get some sleep. TD: What’s your day job? Do you like it or hate it? Any plans to quit it anytime soon? JB: I’m a freelance graphic designer. It’s nice because the busier the music stuff gets. I can just scale back what I’m doing as a designer. Lately, the balance has been shifting more heavily towards music so I’m pretty happy about that. TD: You recently did a Q&A with Interview Magazine which is pretty prestiges. Have you learned about anyone well-known or somewhat well-known becoming a fan of your work with Sun Airway? If so, how did you find out about it? JB: Paul Simon saw our video for “Put the Days Away” and liked it so much he asked Ricardo at Klip Collective to make one for him. Was pretty mind-blowing that it made its way to him somehow. TD: It seems like you enjoy reading and are inspired by it. What books have you read that you’d recommend to others and why? JB: One of my favorite authors that doesn’t get enough play is Paul Bowles. His most famous is probably The Sheltering Sky, but all his novels are great. He deals a lot with isolation and being an outsider in a strange land. His books will make you want to go to Morocco. TD: We love documentaries! Do you like documentaries? Anything interesting that you’ve seen lately? JB: I’m a big fan of documentaries. I just watched the one about Harry Nilsson, which was pretty great. Pretty amazing story and great to learn more about someone that I always found to be very mysterious. TD: What’s your favorite music doc and why? JB: Probably Gimme Shelter. The Maysles can do no wrong, amazing portrait of the Stones at their most vulnerable. TD: You are a Beatles fan. What’s your favorite Beatles album and why? JB: My favorite will always be Revolver. It’s just amazing song after amazing song. I love every second of it. One of my favorite Beatles releases for the last few years has been George Harrison’s “All Things Must Pass”. He later complained about Phil Spector’s overproduction, but it’s so spot on to me. So many great songs on there that just get better with every listen. TD: Do you have any new material in the works? If so, what should we be expecting? JB: I just finished recording (more or less) the first post-Nocturne song called “Wild Palms”. We’re planning on getting a 7” out in the summer and probably a new record next year. I want to take a step up in fidelity and produce a higher-quality recording this time around. I’m thinking of palatial grandeur. Picturing a futuristic Versailles where the music is being made by overly-emotional robots. Lot’s of heavy orchestral stuff mixed with buzzy synths. But who knows really. TD: Are there any other plans to do more projects with Ricardo Rivera from Klip Kollective? If so, what ideas are floating around? JB: Yes, will definitely be working with Ricardo in the very near future. He’s sort of become the 6th member of the band. TD: What local acts that people really aren’t talking about enough do you think we should look out for in 2011? JB: Sadly, I feel like I’ve been a little out of touch with what’s been happening in Philly lately. Really like CSLSX and Golden Ages who we did a show with recently. Really like the Reading Rainbow stuff I’ve heard, Brown Recluse has a new record coming out very soon that’s great (full disclosure: I sing on a song). TD: Anything you’d like to say to the people who voted for you in our Philly Best Emerging Artists Poll and friends, family, and fans that have been supportive over the years? JB: Just want to say a heartfelt thank you. I’ve been making music here in Philly for 10+ years at this point, and it’s such a great place to be. Nice to know that all the hard work is appreciated. 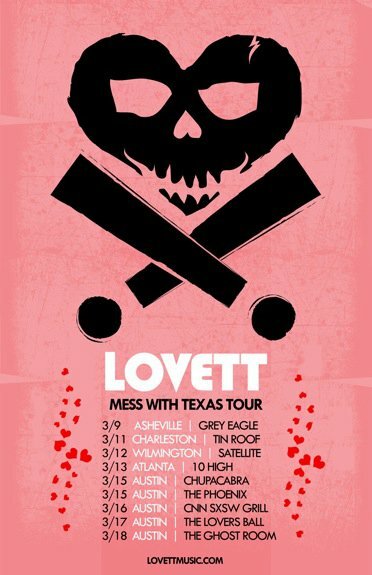 Lovett plays clean-sounding, well-rounded rock music with a Southern twist. 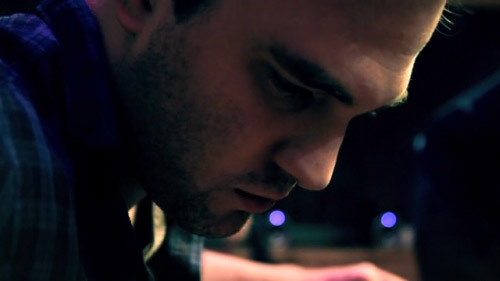 Composer, producer, and frontman Ben Lovett is renowned for writing award-winning scores for films like "The Signal" and "The Last Lullaby", but has been focusing on the band's personal work as of late. "Highway Collection" is a dynamic compilation that is much different from Lovett's former releases. "Eye of The Storm" is full of acoustic guitar, haunting violins, the weeping cello, and eerie falsettos, creating a dark atmosphere much like the music video itself. The video, full of impressive and out-of-this-world special effects, was Lovett's first experience with acting in front of a blue screen. Directed by Chris Alender and shot by Craig Kief, the video tells a story of a lone skycaptain letting go of the things he loves and driving his ship straight into the eye of a destructive storm. The fast-paced and even danceable track "Heartattack" is full of trumpets, trumbones, tambourines and hand clapping, giving it a 1920's swing feel with a rock 'n' roll edge. It's safe to say that Lovett doesn't lack diversity. The highly anticipated album "Highway Collection" comes out today, just in time for SXSW, and should be nothing short of a modern-day masterpiece. Read out full interview with Ben Lovett HERE. 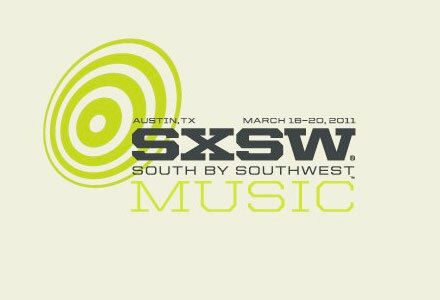 Where to Find Philly Area Acts Down at SXSW!?! FREE ESCAPES V "Virgin Kickoff, Maiden Voyage"
Pitchfork TV has released a new session with Smith Westerns. 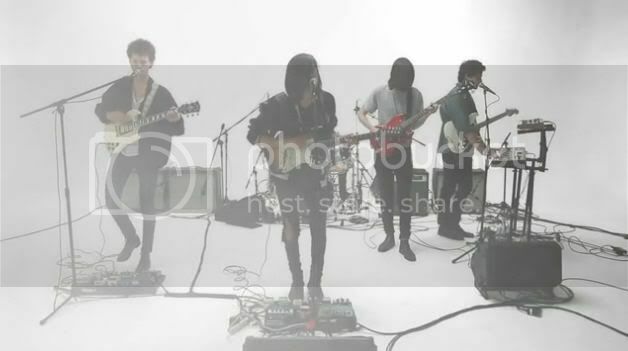 The band perform's four tracks for their recently released album Dye It Blonde. The band is performing six shows at SXSW including the Pitchfork Party on 3/17 at The East Side Drive In, 6:15pm and the NPR Showcase @ Stubb's BBQ pn 3/16, 10:15pm.